Previous studies demonstrate disparities in health and health services including gambling disorders (GD) among ethnic and racial minority groups. In this review, we summarize studies examining the prevalence of GD across different ethnic and racial minorities. We describe the sociodemographic subgroup variations at heightened risk for GD and factors associated with GD in racial and ethnic minority groups including gambling availability, comorbid substance use, psychiatric conditions, stress, acculturation, and differences in cultural values and cognitions. We found that research of GD among minority groups is scant, and the prevalence of GD among these groups is at a magnitude of concern. Racial and ethnic minority status in it of itself is not a risk factor for GD but may be a proxy for underlying potential risk factors. The need for prevention and treatment programs for different cultural group remains unmet. Mayumi Okuda reports grant from National Institutes of Health, Eunice Kennedy Shriver National Institute of Child and Human development—1R01HD060072, grant from Chapman Perelman Foundation, during the conduct of the study. Weiwei Liu reports grants from Office on Women’s Health, grants from National Institute of Drug Abuse, grants from National Institute of Justice, grants from Substance Abuse and Mental Health Services Administration, and grants from National Institute of Mental Health, outside the submitted work. Jodi A. Cisewski reports grants from National Institutes of Health, Eunice Kennedy Shriver National Institute of Child and Human Development—1R01HD060072, during the conduct of the study. Silvia S. Martins reports grant from National Institutes of Health—The Eunice Kennedy Shriver National Institute of Child and Human Development—1R01HD060072, during the conduct of the study; personal fees from Purdue Pharma, grants from National Institutes of Health, National Institute on Drug Abuse—1R01DA037866 and 1R01DA039454, outside the submitted work. Luis Segura and Carla L. Storr declare that they have no conflict of interest. This article contains studies with human or animal subjects performed by some of the authors (Okuda, Luiu, Storr, and Martins). Local Institutional Review Board approval was obtained and maintained for studies where human (or animal) subjects research was performed. Department of Economic and Social Affairs UN. International Migration 2015 Wallchart In: Population Division. 2015. http://www.un.org/en/development/desa/population/migration/publications/wallchart/docs/MigrationWallChart2015.pdf Accessed December 15 2015. 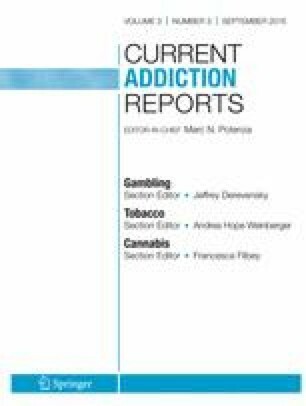 Le G, Liao M, Lee S, Kent W. Youth Gambling in the 21st Century: Prevalence, Impact, and Interventions. In: NAPAFASA Problem Gambling Publications. 2016. http://www.napafasa.org/resources/PGP.Youth Gambling in the 21st Century.pdf. Accessed January 25 2016. This article presents insight on the high prevalence of gambling among youth in the U.S.
Wickwire EM, Whelan JP, Meyers AW, Murray DM. Environmental correlates of gambling behavior in urban adolescents. J Abnorm Child Psychol. 2007;35(2):179–90. doi: 10.1007/s10802-006-9065-4.